Xviewer lets you transfer files between the DL(M) series instruments and a PC, and gives you remote control of the instruments using your PC. 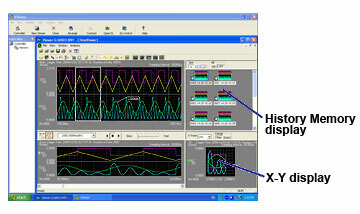 Xviewer enables online and offline waveform display, computation, and analysis of data captured using Yokogawa's WE7000 series of PC-based measurement instruments.Free version, XviewerLITE is also available. 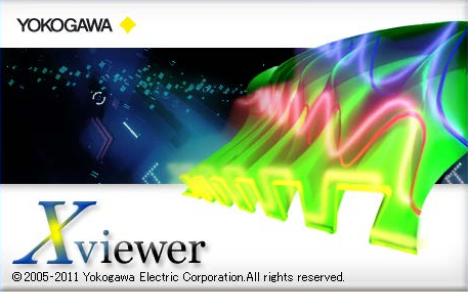 Xviewer is a PC software application designed to work with Yokogawa DL series digital oscilloscopes and ScopeCorders. It allows you to display acquired waveform data, perform file transfer, and control DL series instruments remotely. In addition to simply displaying the waveform data, Xviewer features many of the same functions that the DL series instruments offer; zoom display, cursor measurements, calculations of waveform parameters, and perform complex waveform math. Using Xviewer binary waveform data can easily be converted to CSV, Excel or Floating Point Decimal fomat. 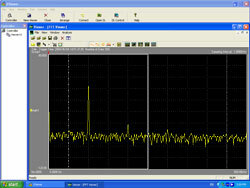 Additionally, Xviewer can also be used to display and analyze waveform files captured using Yokogawa's WE7000 or SL1000 high-speed data acquisition hardware. Xviewer's zoom function works in the same manner as that on the DL instruments; displaying the entire waveform and a zoomed subset of the waveform simultaneously. The waveform can be horizontally and vertically zoomed. Even large amounts of waveform data (More than 2GP with the DL850) can be viewed quickly. The zoom window can be automatically scrolled (with variable direction and speed). Comments can be added as needed, in any position, on the waveform viewer window. All comments, plus the waveform(s) can be printed as displayed. Using the DL series instrument's history memory, you can arrange and display thumbnails of multiple acquired waveforms. The selected waveforms are expanded and displayed in the Main screen; multiple waveforms can also be superimposed. Using cursors, you can display the measured values at the points where the cursors intersect the waveform. There are three types of cursors available: horizontal, vertical, and X-Y. If two cursors are displayed, the difference between the them can be calculated and displayed. 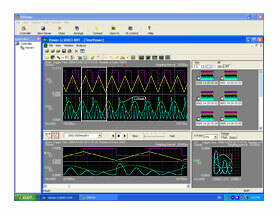 Up to 32 math waveforms based on the displayed waveform data can be calculated and displayed. In addition to simple addition, subtraction, multiplication, and division, user-defined equations can be created using a large number of functions including: trigonometry, differentiation/integration, pulse width computation, and six types of FFT calculations. FFT analysis using up to 2M data points can be performed, and a wide variety of functions are available for frequency domain calculations such as power spectrum and transfer functions (amplitude and phase). Digital filtering (low pass, high pass, band pass) calculations for noise rejection and other applications are also included. Frequency domain waveforms are displayed in a dedicated FFT viewer window. 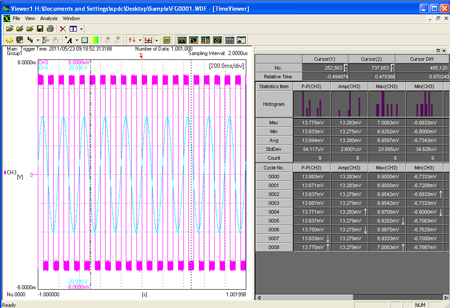 Parameters (characteristics) of the displayed waveforms can be automatically calculated and displayed. Up to twenty-six parameters can be selected. Calculation of the selected parameters is performed automatically and the measured results are displayed in a list (as shown on the left). The results of these calculations can be saved in a CSV file. Cycle Statistics and History Statistics functions, which are both available in DL series instruments, can also be available in Xviewer when the software version is 1.70 or later. A histogram of statistical result(s) can be displayed as well. The statistical result(s) can be saved in a .csv file. 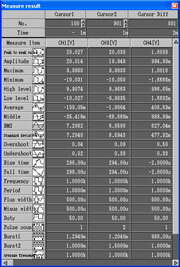 Waveform data files in binary format (useful for data transfer because of their smaller size) can be converted to ASCII, Excel or Floating Point Decimal format and then opened using a spreadsheet program. It also can be converted into MATLAB(*.MAT) format file, then it can be imported into MATLAB. MATLAB is a registered trademark of The MathWorks, Inc. in the United States. A report can be made using displayed waveforms, cursor values, parameter measurement results and any text data. Five(5) kinds of report files (samples) are provided by default. These samples can be edited freely, or you can arrange your-original report as well. Xviewer supports Ethernet, USB and GP-IB interfaces, allowing you to control DL series* instruments using the PC on which Xviewer is installed. 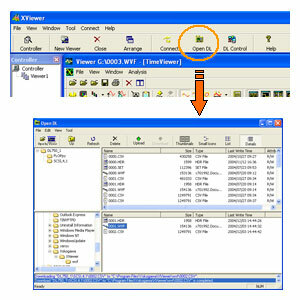 A virtual image of the screen and front panel of the DL that Xviewer is connected to is displayed on the PC. You can perform operations remotely by using your PC's mouse to "click" keys on the virtual screen as if you were pressing the actual keys on the DL. You can perform file transfers between a DL series * instrument and the PC on which the software is installed, via Ethernet, USB or GP-IB. When you connect with the DL, Xviewer displays a list of files residing on the DL. You can select files from the list for download to the PC. The following option functions are available. This option satisfies your needs for auxiliary functions that the DL850 series main unit alone cannot provide. This option consists of the following tools. If an abnormality occurs during a long duration continuous test, you can analyze the saved measured data without having to stop measurement! File merging Multi-number of DL850 series data files divided in time or channel order can be merged into a single file. File dividing A large(long) recorded data file can be divided into multi-small files. It can be equally divided or any portion can be extracted and resaved. It helps you to handle the data file easily. Converting formats Binary data file(s) recorded by DL850 series can be converted into a CSV or floating format which can be imported into MATLAB. Online file transfer and Remote Instrument Control are not possible with the DL1700 and WE7000. The DLM2000 series firmware version 1.08 or later is required. Please use the latest version of the instrument’s firmware. Parameters: Max. 28 items such as P-P, Amp, RMS and Freq. Cycle Statistics and History Statistics are available when the software version is 1.70 or later. *Click here for detail of these operations. Waveform Data Conversion: File(s) with an .wvf or .wdf file name extension can be converted to ASCII (.csv), Excel (.xls) or Floating Point Decimal format(.fld). DL750 series/DL850 series realtime recording files can be converted to Binary (.wvf), ASCII (.csv), Excel (.xls) or Floating Point Decimal(.fld) format. *A dedicated USB driver is required when using the USB interface. The USB driver can be downloaded from the y-Link. *The operation of the PCMCIA-GPIB card is not guaranteed on Windows Vista or Windows 7. The following issue is fixed. - Computational(Math) waveform(s) may not be displayed correctly. - Waveform(s) may not be loaded correctly. Support for the 720250 10MS/s module, 720281 frequency module, 720268 Hi-voltage module, and 720266 temperature module. The following issues are fixed. - The annotation may not be reloaded on the display. - Waveform(s) may not be loaded when using on Korean operating system. Added a feature that measures waveform parameters and history statistics over the entire range (mode in which automatic measurement is not performed). Supports modules 720211, 720243, and 720254. Support for setting the distal line, mesial line, proximal line, and high and low values for each channel. Performance is improved for display update speed and file size reduction. Support for transferring (uploading) files from a PC to the measuring instrument through Ethernet interface. Supports Windows 8 (Windows Vista is unsupported.). Support for the DLM4000 series logic 16 bit input. Added file division for each history waveform. Added a feature that measures cycle statistics over the entire range (mode in which automatic measurement is not performed). Improved the measurement speed of the pulse count. Added history statistics and cycle statistics to the annotation types. Added a feature for turning waveform interpolation on and off. Support for Math operations over a specified range. Added a feature for changing the waveform thickness and grid line thickness that are displayed on the screen. Support for the DL850/DL850V Real Time Math(/G3). Support for the Xviewer EYE. Added Function: Improvement of File Merging function for the /JS option. Support for DL850V DL850 Advanced Utirity. Support for the SL1000 mark function. Full support for the DLM2000 series. Added function for manual placement of waveforms on the split screen. Added character size changing function for T/div display. Added initialization function for screen display conditions. Added types of annotations, and improved annotation functions. Support for German and French languages. Support for the DL1735E, DL9505L, DL9510L, and DL9705L. Selecting absolute time or relative time when saving ASCII files. Converting WDF files to multiple WVF files. Report can be saved by rich text format(rtf). *1Waveform data (wdf file) can be loaded. *2Supported on virsion 1.30 or later on the DL1600 series and virsion 6.01 or later on the DL750 series. *3DL750 series, DL9000 series, DL7400 series, DL1700 series, DL1700E series, DL1600 series and WE7000. *5DL1700E series: version 2.11 or later, DL7400 series: version 2.11 or later. *6With the DL750 series, even if you load files that were saved with P-P Com ON in the Save As dialog box, the Upper/Lower, colors, and number of screen divisions are not restored. *7With the DL1600 series, even if you load files that were saved with Invert ON in the channel settings, the Invert information is not restored. *8DL9000 series: version1.80 or later.